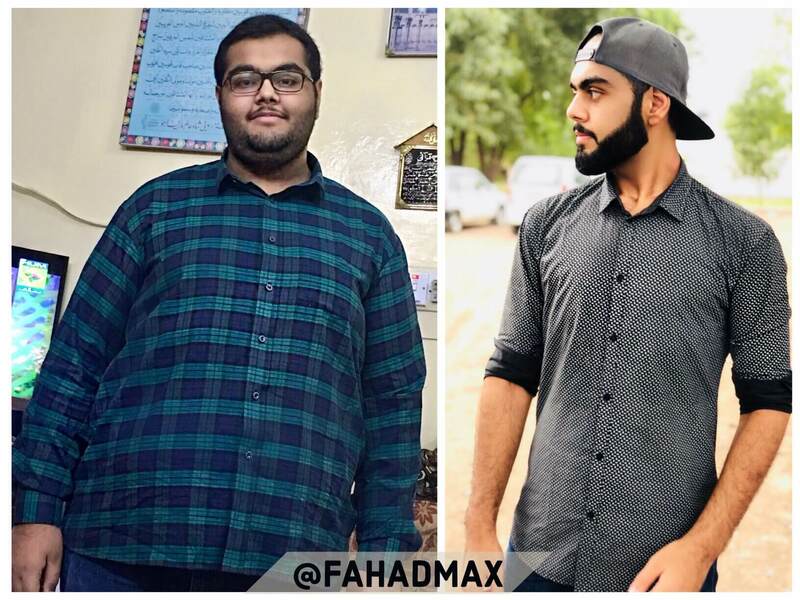 This Pakistani Guy's Incredible Weight Loss Transformation Has Left Everyone Speechless! 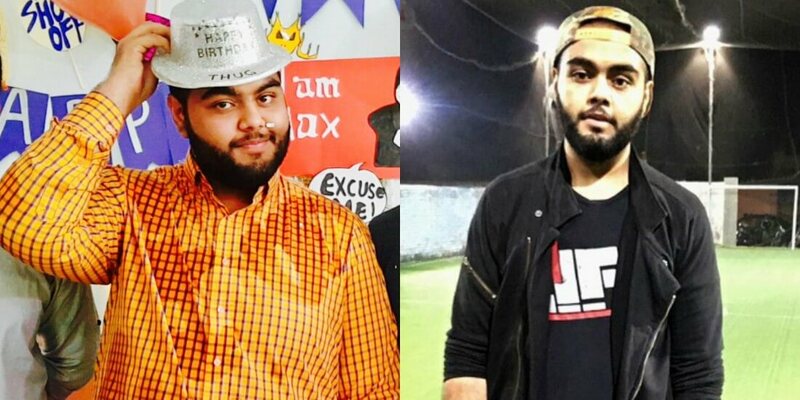 This Pakistani Guy’s Incredible Weight Loss Transformation Has Left Everyone Speechless! Since my childhood, I was extremely overweight. I was the fattest, wherever I used to go. I loved to eat a lot and it was my habit to eat more than everyone. I enjoyed food and couldn’t stay away from it. Everyone just loved me the way I was no one ever told me to lose weight before. They loved the unique body that I had. My friends loved to hug me due to that big soft belly. Everyone used to call me ‘Cute’. Wherever I used to go I was treated differently from others. Some people however used to look at me and laugh. Sometimes it would depress me but I never really cared about it. My father had diabetes and a heart problem. He wanted me to go slim & wanted to see me reduce weight and one week before his death, he said those words to me that I mentioned above. This was the exact wording of my father and acting upon these words, I started going to the gym the very next day. I was eating healthy and trying to reduce weight. But after one week, my father passed away all of a sudden, he was performing his duty in the District Hospital and he had a severe heart attack. I have a strong belief in Tawassul (Waseela) it earns the nearness of Allah Paak. And how can the Waseela of the Most beloved to Allah be rejected? And when you stand in front of the best of creation, your life definitely changes. I prayed for my health and Allah Paak blessed me with His mercy and only Allah can change the most hopeless situations into the best moments of your life. As soon as I returned home, I joined the gym. 18 April 2017, the day I started my weight loss journey with zero knowledge about diet and exercise. I went to the gym and started exercising. At my heaviest, I weighed 155 kg (342lbs.). I had no stamina, no energy but I kept going. Each day was a struggle for me. It was the hardest thing in the start but it didn’t stop me from achieving my goal. Nutrition was the most important thing so I started researching it and started gaining knowledge about it. The one thing that I can tell you is that nobody believed in me except for only one person, my brother Faisal he always encouraged me to do this. People laughed at me in the gym for even trying to change my physique. I used to do warmup exercises outside the gym people would see me and made fun of me, some stared at me sinisterly but I didn’t care. I stayed quiet and just did what I needed to do. Diet was the number one priority so I completely eliminated junk food, cold drinks, rice, sugar, and every type of processed food from my diet and ate healthy foods. In the first 7 months, I had no cheat meals. It wasn’t a 7 days program or a month’s challenge. It was a LIFESTYLE change. I knew it and I changed my way of living, thinking and got rid of my bad habits. I’ve sacrificed many things for this change and have worked very hard day in and day out to get here. I was mocked by my friends for my new habits, lifestyle & dieting routine and how I would not eat unhealthy food. In my mind, the biggest sacrifice is not eating what you love to eat and what you used to eat (A LOT ). When everyone around you is eating whatever they want to and you’re not, that’s where discipline comes in. Anyone can do exercises but when it comes to restricting the things you want to eat is what matters the most! I was determined for a change so I stayed away from eating unhealthy. During the last 14 months… I have seen many things change. I have seen people change when they saw my progress. From “Tu Karega Wazan Kam?” To “ Yar Bara Wazan Kam Kerliya Hai”, “Kuch Din Ka Shoq Hai Phir Bas Hojaegi” to “Bohat Himmat Ki Hai Waise”. Also heard things like “Sari Zindagi Kha Kha Ker Ab Tu Wazan Kam Karega?”, “Nahen Hoga Tere Se, Chor De”. Did I care? No. I believed in me when no one else did that’s what made me who I am today. Right now, all you can see is a picture. A “before and after” transformation photo but what you don’t see is the struggle, the dedication & all the effort that I had to put in during the last 447 days to get there. There were times when I messed up, made mistakes but I never gave up. Even when my whole body was sore from exercises, I was relentless, even when I was in pain & wanted to rest or when I wanted to eat my favorite food, I didn’t and I was persistent. Not once did I think of giving up. Those words of my father were in my mind all of the time. I never wanted to quit this mission. I knew it wasn’t going to be an overnight change so I was consistent with my diet and exercise. I became addicted to watching my body change. Consistency is the key in everything. I remember when my weight was stuck between 104-101 for so long but I was determined. Patience and fortitude conquer everything. And all the hard work the sweat & the sacrifices paid off! 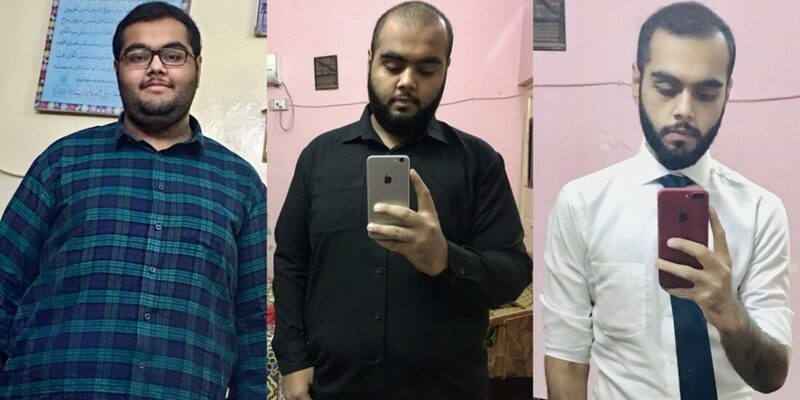 I’ve reduced 75 kgs, got rid of blood pressure medicines but most importantly I’ve beaten obesity. Alhamdulillah, for this change, Allah Pak blessed me with this opportunity & without His mercy, I couldn’t have achieved anything. He gave me the strength to do what I did and without His endless blessings, I am nothing. So pray to Allah for everything that you want and surely He will provide you and you will be satisfied! Put the highest part of your body – your head, on the ground to get the greatest rewards! I still pray for my good health. Recite Darood Shareef daily. Be consistent with your prayers and thankful to Almighty Allah. Till now, I have only told you about naysayers. But the people who supported me & appreciated my work, I want to thank all of you. You have no idea how much your kind words mean to me! 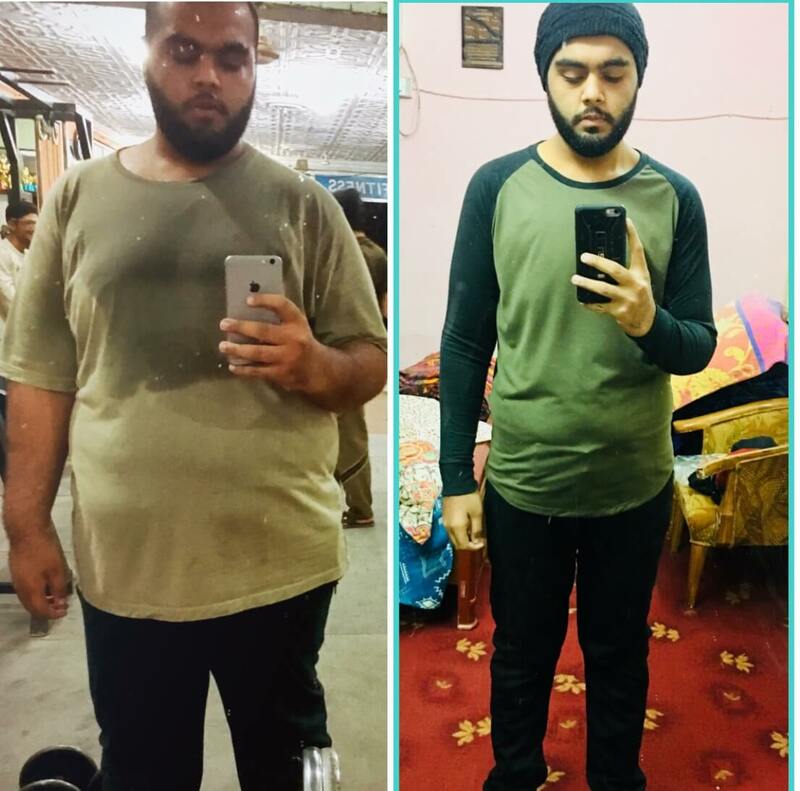 I want to thank my trainers Amir Bhai in Vehari and Affan Bhai at Cross Fit in Multan. Thank you for your countless efforts in helping me achieves my dream. All those super, power & drop sets along with different exercise routines, they really helped throughout. If you want something in your life, you have to work for it, you have to be disciplined and the most important rule of success, you have to be consistent. Let me dare you to believe in yourself! If I can do it, anyone can! And besides, how many success stories do you have to hear before you create your own? Don’t you think that you’ve waited long enough? First, they will ask “why you’re doing it?” Later they’ll ask “how you did it?” So go and fight for your dreams & achieve them! It’s a new beginning for me Alhamdulillah, but one should never settle & I still have much more to achieve in the future. 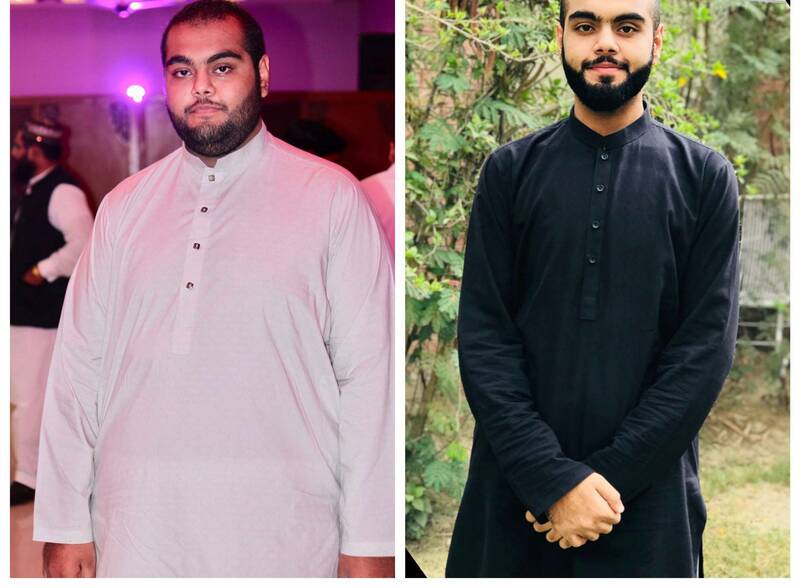 INSHAALLAH and after listening to all the appreciation that I get from people every day, I still wonder how my father would have reacted to this change! And I just hope that I’ve made him proud!